I found her half under the slightly raised water container and got her out. she lies down and wont move unless picked up, and then it’s only to get comfortable again and drop her head. 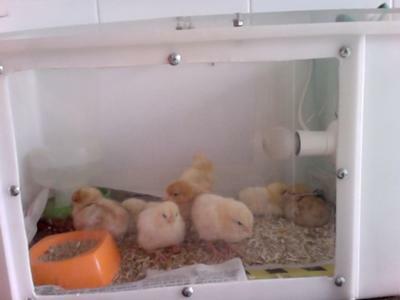 We thought that the brooder was too hot because all the chicks were on the opposite side to the lamp and panting almost? we turned the lamp off and the other chicks were back to normal except this one, who was chirping in the middle of the night when we had the lamp back on. She’s not eating or drinking. the other chicks were sleeping around her but now she is just ignored and pecked when she chirps. 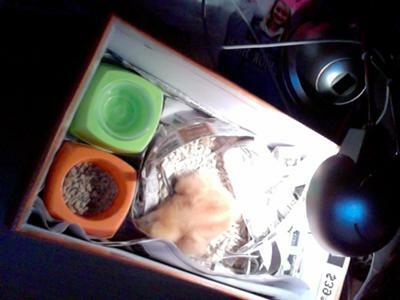 We took her out and put her in a shoebox under my halogen lamp to keep her warm but she still just lies there. She's been like this all of yesterday and today. We're using regular chicken feed, there are 9 chicks. 5 males and 4 female. This is one of the females. Not sure what breed, as we got them for a preprimary class with a program and are looking after them at home for the weekend, but it would be a common West Australian breed. Panting is a definite sign of too much heat. Too much or too little is not healthy. At this age they need a heat source supplying about 90 F. You might be able to change out the light bulb to a lesser wattage and accomplish the correct temp, or by moving their lamp higher. There should be a thermometer in the brooder at the chick’s level to easily monitor temperature. Too much heat can produce imbalance in electrolytes, restoring electrolytes with a product designed for chicks is best. Gatorade or Pedialyte will work (human electrolyte products). Too little heat will cause organs to shut down, lethargy and death, but they usually call for help with loud peeping. If a chick becomes too hot or too cold major organ problems can arise, both conditions are life threatening. She may have gone through too much stress to recover. Getting her to the right temperature may help, if not too late. Offering electrolytes with a dropper or spoon can help them take in a little at a time, but don’t force if she’s not swallowing on her own as fluids may go into lungs and cause a worse problem. (Home made electrolytes would consist of a pinch of salt in a little sugar water; ¼ cup water, 1 tsp sugar or honey) If you are to save her, you must get some calories into her. Liquified chick start, a little apple sauce may help, but only if she’s swallowing liquids on her own and alert.